The best vantage points over 2000 m altitude in Val Gardena. Seceda, Ciampinoi, Piz Sella, Plan de Gralba and Dantercepies. Of these the most beautiful alpine meadows ski slopes start to Val Gardena and Sella Ronda in the Dolomiti. The south-facing slope above the Col Raiser skiing area with panoramic views of Sasso Lungo and Sellamassif. Wide slopes, sunshine, gourmet huts for foodies and long slopes to S. Cristina and Ortisei. Seceda is connected by the underground funicular Gardena Ronda Express with the ski carousel Dolomiti Superski. The skiing area of Ciampinoi with the world famous “Saslong” FIS World Cup downhill. Each year the race meets in December the skiing elite for 2 Fis races: Super-G and downhill with over 120 km/h top speed! 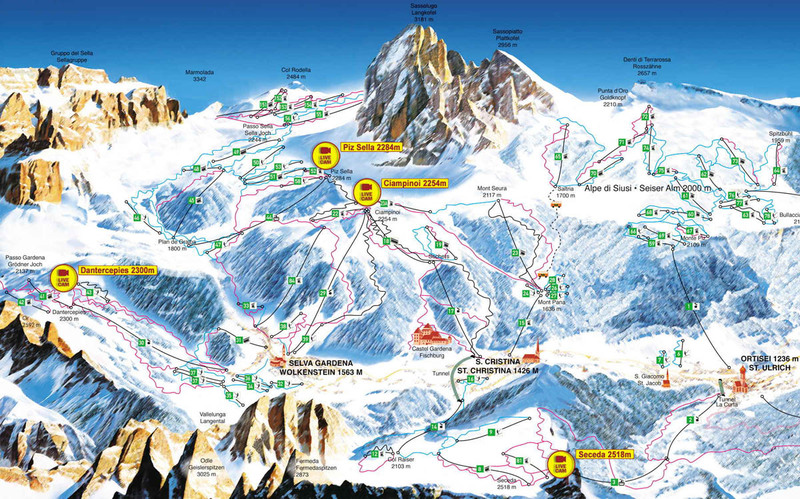 The Plan de Gralba-Piz Sella ski area is located at the foot of the majestic mountain Sassolungo (3141 Mt). Ideal slopes for beginners to advanced. The various snow-parks and boardercross slopes are the ideal meeting place for snowboarders and freestyler. The Dantercepies slopes are known for the perfect preparation. Among them is the women’s downhill Alpine Skiing Championships 1970. Red and black pistes provide breathtaking descents. Download the new ski map of the skiing area Dolomiti Superski 2015-16.